Wesley McNair has been called by poet Philip Levine “one of the great storytellers of contemporary poetry.” He is the author of eleven volumes of poems, including two limited editions, and twenty-two books, comprising poetry, nonfiction, and edited anthologies. McNair has held grants from the Guggenheim and Fulbright foundations, two Rockefeller grants for study at the Bellagio Center in Italy, two NEA fellowships. He has been selected for a United States Artist Fellowship, and he has twice been invited to read his poetry by the Library of Congress. 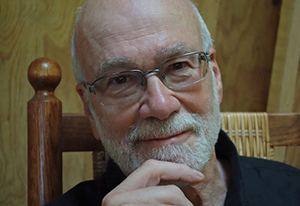 Other honors include the Eunice Tietjens Prize from Poetry magazine, the Theodore Roethke Prize, an Emmy Award, and the Sarah Josepha Hale Medal, for his “distinguished contribution to the world of letters.” His poetry has been featured on NPR’s Weekend Edition, Saturday and Sunday editions, and 22 times on Garrison Keillor’s Writer's Almanac. It has also appeared in the Best American Poetry, The Pushcart Prize annual, and over sixty anthologies and textbooks. Last year he was named as the recipient of the 2015 PEN New England Award for Literary Excellence for his collection, The Lost Child: Ozark Poems. (David R. Godine, spring 2017), his ninth full length collection. the ballroom of a mansion. and over, drying the nonexistent tears. new class, working her toes in her shoes. like any other small things fastened to earth. into the parking lot of the school. clutching her heart and laughing. From his selected poems, Lovers of the Lost, and seven other collections: The Lost Child, The Ghosts of You and Me, Fire, Talking in the Dark, My Brother Running, The Town of No, and The Faces of Americans in 1853.
and that more distant thing I dreamed of. at night, my father gone. angry mouth, gone away herself. a new suit if I was good? I was afraid not to be good. My mother switched and stitched. in her eyes and hair. together in the dark all night long. bandage now, was perfect too. I was the one who wasn’t. I had to be such a bad boy. those years he only did the carving. and insisted that I learn to be a man. on his hip in the doorway. to drive him to the football game. down at his size-fourteen black shoes. who squinted helplessly against the wind. wandered and he fell out of step. among these, his fellow Americans. shocks in the driveway, still unpaid for. to join them, I opened the door to my life. like us inside by displaying a fancy lobby? on the bureau’s top in a zigzag, breaking heart. and persistent and lucky life together. and ice cream, just a small scoop. breathes into the mouth that does not breathe back. and garbage and piles of unwashed dishes. and why the government had denied them. the others nodding and saying, Listen to Wesley. as if she had been slapped hard. but did not know they meant, themselves too. turn around and say something. the ache of a body surrendering to age. old work of making things clean. discovered he will spend his life there. he senses a threat to it. no one would ever come near him? in subways, offices and malls across America. At first the job is a cinch, like they said. is grinning half outside of his face. his name through the bars. “We’re trapped! no power to rise out of their bodies. We were just starting out when it happened. At the school where I taught the day was over. As far as they could tell, it wouldn’t be fatal. But the principal couldn’t finish the announcement. I had a dentist appointment right after work. By then, we now know, the president was dead. On the way, I hurried home to tell my wife. I remember Jackie’s pink pillbox hat in the film. Turn off the vacuum cleaner! I shouted at her. I kept thinking I was going to be late. I had never made her cry like that. In one frame Kennedy’s head goes out of focus. The funny thing was, the dentist didn’t care. We didn’t realize there would soon be others. to watch the two of them smoke. had its own tail of smoke. and blowing it into death’s eye. is always between us, no matter what we do. purposes and speeding away inside the glass? the car picking its way down the road through the dark. as if all his loss has led to finding just this. at the strangest moments, over the smallest things. they glide, eyes closed, on love handles across the floor. into this moment made for nobody else? in the light of your friend’s eye. which you can never get enough of.